Make the school yard as safe and comfortable as possible with high-quality school shades all shapes and sizes. The school yard should be a place where children can enjoy themselves safely all year round. You can help create a more protective environment with shade sails that offer safeguarding against sun damage as well as shelter from rain, so that no matter what the weather conditions are, the school yard is as comfortable as possible. Shade and shelter will help keep everyone happy and healthy. We offer a range of school shades in different shapes and sizes, all offering maximum UV protection and professional construction that means that your sail can last up to 10 years. On extremely hot days, students can still enjoy the outdoors during recess and stay safe with a school shade that offers up to 98% protection from harmful UV rays. UV inhibitors prevent any rays from penetrating the fabric, and UV stabilizers protect the quality of the shade sail itself by preventing sun damage and deterioration. In addition, breathable fabrics increase air circulation, helping to cool down the area beneath the shade to make summer more comfortable. In light rain showers, your school shade will provide a drier area, with water-resistant properties that prevent too much rain from seeping through the fabric. 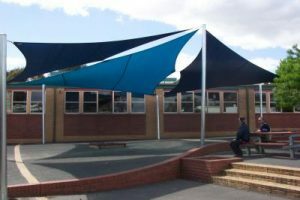 We offer shade sails in all different sizes and dimensions so that you are sure to find exactly what you’re looking for, no matter how big or small your school yard is, and whether you want to cover the entire area or just a select section. Different colours have different heat absorption properties, so depending on your primary concerns you can choose from a variety of different coloured fabrics to keep your school yard comfortable. Different shapes from square to triangle are available so that no matter what design you prefer, there is something to suit your preferences. We offer two great options to make installing your school shade as hassle-free as possible: an affordable and reliable installation service for all suburbs across Melbourne, and simple-to-use, professional do-it-yourself options. Working quickly and efficiently, we install high-quality school shades in all suburbs across Melbourne, guaranteeing a professional construction for the maximum safety and protection. Geared towards your convenience, we get the job done with expertise you can rely on, all for an affordable cost, including a free consultation, measure and quote. It’s easy to install your own school shade if you prefer. We make it simple for you by providing all the materials you need to complete a safe and stable construction, including posts, fabric, structures, fixtures and fittings, so that you can achieve professional results with minimal effort. Keep the school yard comfortable and protected with premium-quality school shades designed for your purposes.